I know we’ve been pretty quiet lately, but we’ve been extra busy with many things, the biggest one being our wedding! 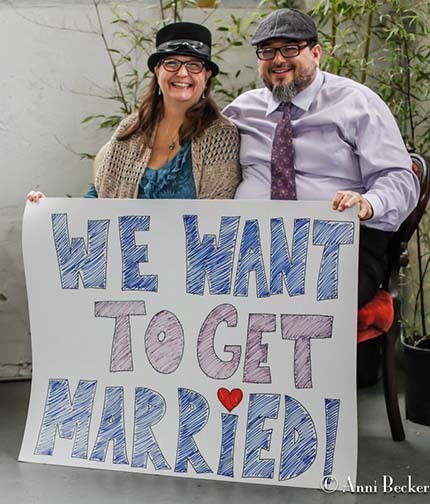 We had already decided to get married on the first day it was legal if marriage equality passed in Washington, so once we found out it was a done deal, we only had about a month to plan. 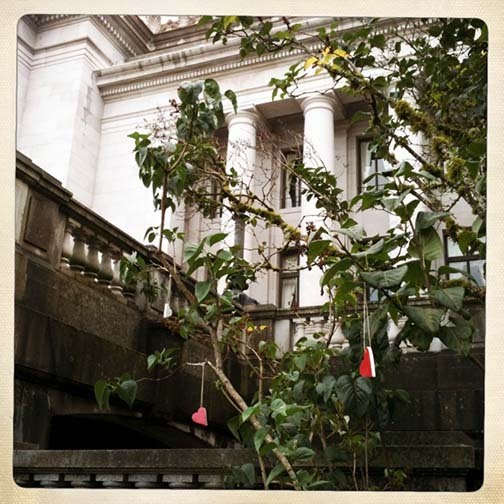 We did a couple of small (he)art bombings in November, one at a private residence and one at a book reading. The project has been on the back burner a little, but that doesn’t mean we aren’t thinking about it every day. 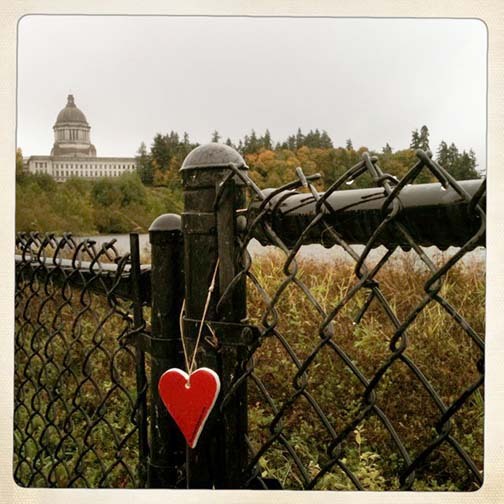 We read about a mass wedding on December 15 in the state capitol building, and we are seriously considering driving up to Olympia to pass out hearts to all of the newlyweds and to give the city a fresh (he)art bombing. We’ll let everyone know if and when we decide that we are definitely going. 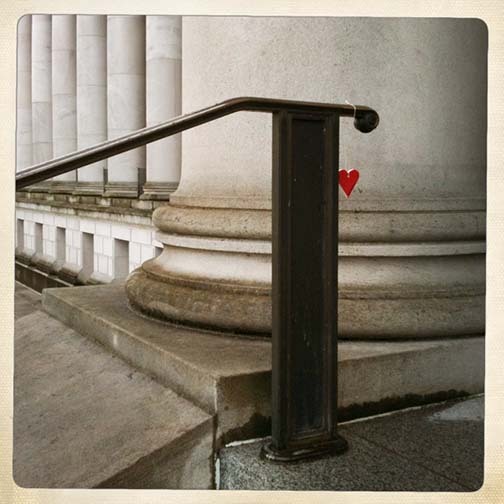 The biggest plans we have in the works is a trip down to San Francisco to (he)art bomb the bay area. We are so committed to this trip happening that the only wedding present we are asking for is contributions to our travel fund. We really hope we can meet our goal in a couple of months. If you can donate any amount, large or small, or help us spread the word, we would be very grateful. 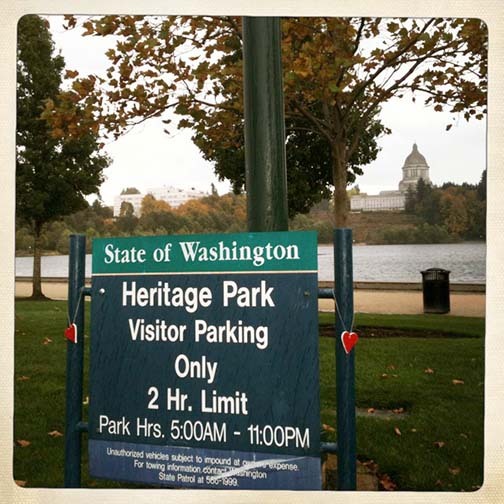 Last weekend we drove up to the Puget Sound area to (he)art bomb Olympia and Seattle. 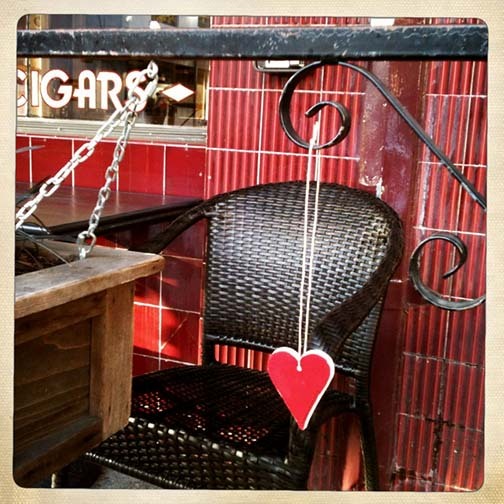 We hung almost 400 hearts in total. 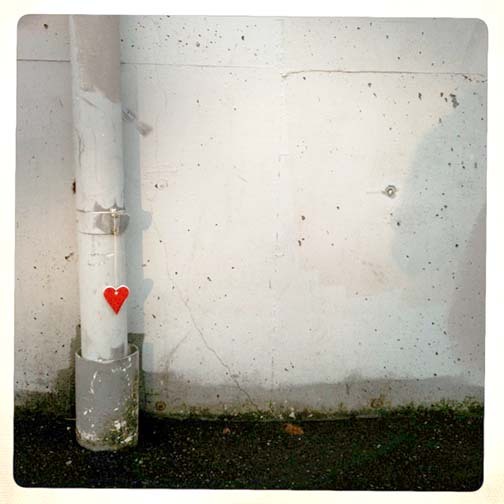 It’s amazing how much work it can be and how long it can take to hang that many hearts – and the realization of what a tiny fraction of each city we covered after hanging them was rather humbling. 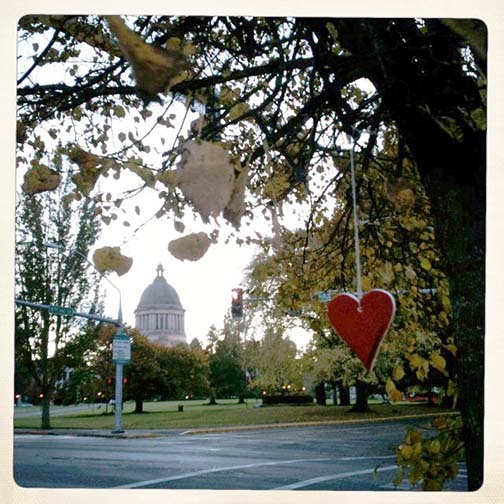 Saturday we (he)art bombed downtown Olympia. 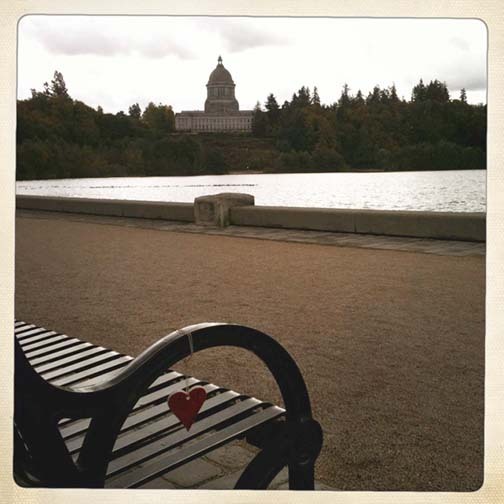 It’s been our goal from the beginning to do at least one (he)art bomb in Olympia since it is the state capitol and the starting place for all of the ups and downs of our fight for marriage equality in Washington this year. We appreciate what the legislature did for us, and we have agonized over the past few months about how the upcoming vote will turn out. Depending on how close the vote is, in a week and a half Kelly and I may know if we can get married or not. It is exciting and nerve-wracking and many other things all at once. 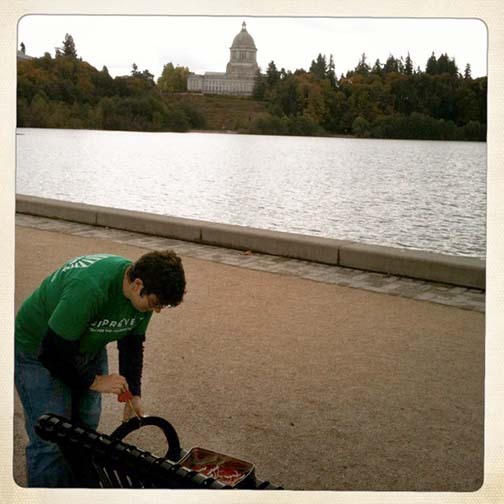 We started at Heritage Park, just a stone’s throw from the capitol building. 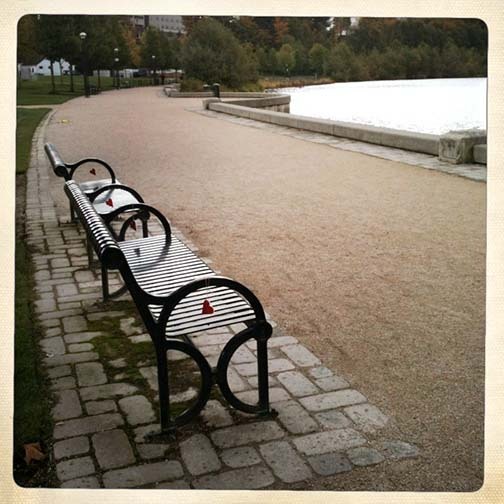 It’s a lovely park with a nice walking path around a small lake. The weather did not cooperate most of the time – wind, rain, hail, and biting cold temperatures – but we did our installation anyway. 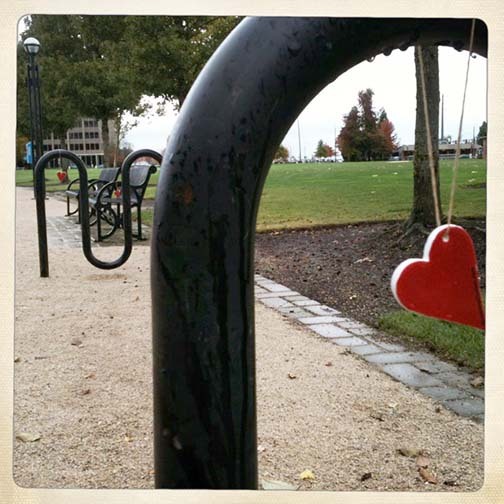 We hung about 100 hearts at the park altogether. 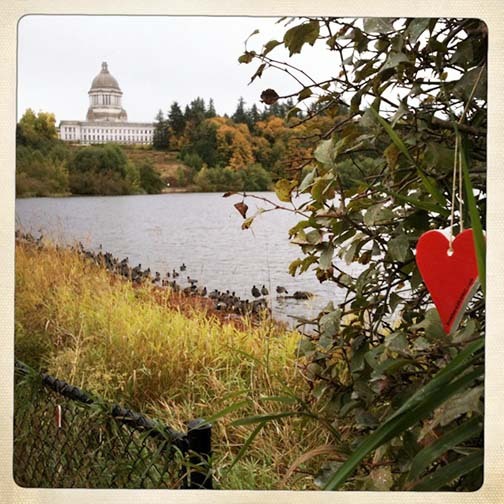 Then we went to the capitol campus and hung a few hearts. Coincidentally, there was a wedding party having their photos taken on the steps of the Legislative Building. 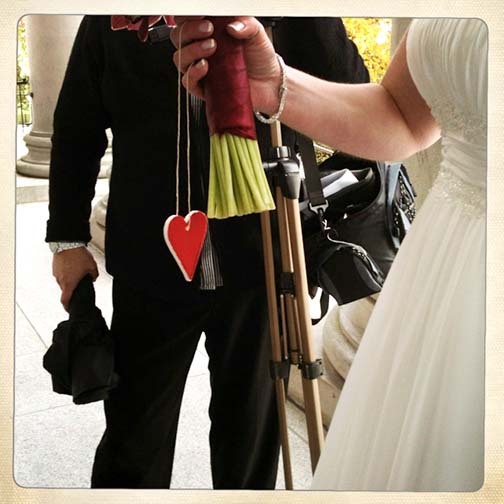 Kelly made sure to give a heart to the bride – it just seemed right. 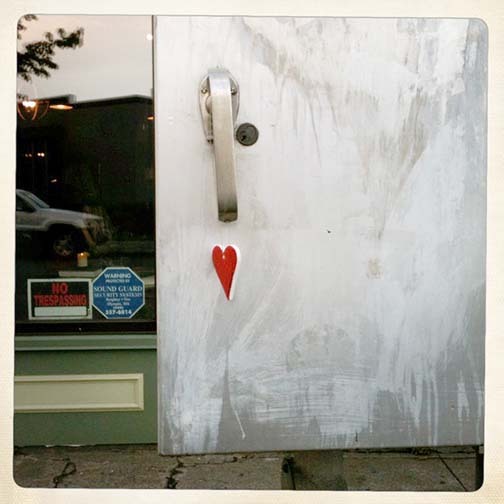 Then we wandered around downtown for a while just hanging hearts wherever we pleased. 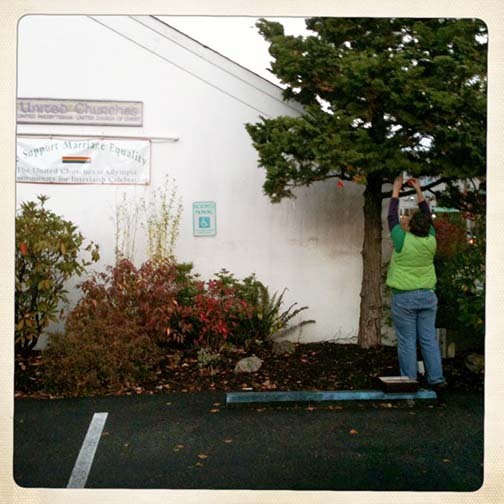 And finally, on our way out of town and on to Seattle, we stopped at a church that we just happened to pass that had multiple signs and banners supporting marriage equality and the LGBTQ community. We (he)art bombed them as a way of saying thank you to a bunch of strangers who didn’t know us but were fighting for our rights. Recently we spent an afternoon with Derrick and Kurt, a delightful couple from California. They have been together just shy of 20 years. 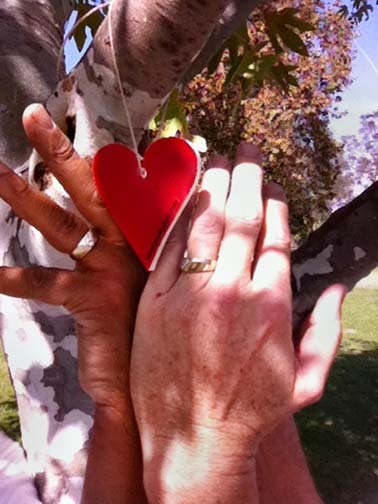 They are also one of the lucky couples that got to marry legally, in 2008, before Prop 8 passed. 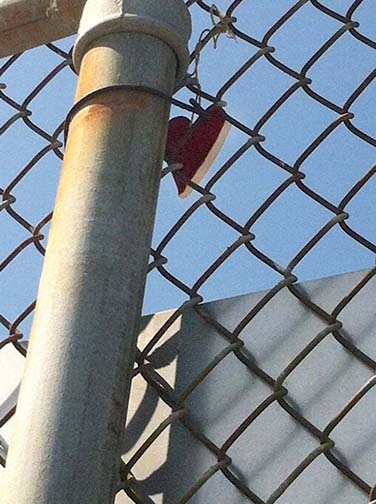 Derrick and Kurt love to play tennis together, so they hung a couple of hearts at the park in North Hollywood where they play tennis weekly. Thanks for bringing Love is a Radical Act to California! 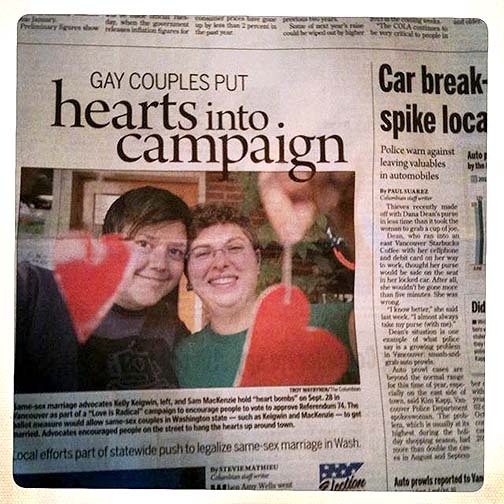 We’re super excited to be on the front page of today’s paper talking about marriage equality and Love is a Radical Act. 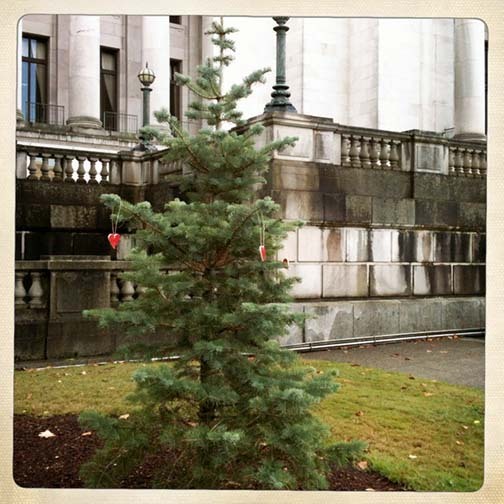 This Saturday’s installation up in Olympia (and Sunday in Seattle) will be our biggest action before the election. 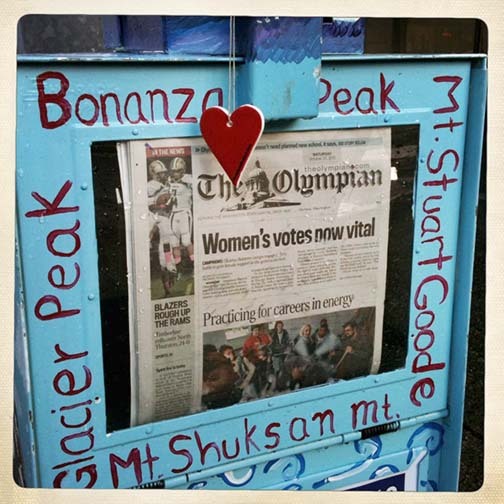 Thanks to everyone for supporting those who engage in the radical act of love.